Welcome to EveryBody Matters: Embracing Size Diversity! This course focuses on fatness as a social and cultural construction, examining the relationship between discrimination caused by body size and gender, race, and social class. Students will use social justice and healthcare perspectives to question weight bias and explore ways in which the fat community and its supporters resist sizeism. A 2010 study from Yale University shows that body size discrimination occurs at the same rate as racial discrimination, particularly among women. Despite the fact that "overweight" and "obese" people make up the majority of Americans (69% according the CDC), sizeism is often socially acceptable and even legal in many instances. "Obese" children are 63% more likely to be bullied in elementary school, and "youth who are victimized are more vulnerable to depression, low self-esteem, poor body image, and suicidal thoughts" (Friedman and Puhl 6). This course offers an alternative view of fatness that accepts the reality of a diversity of body shapes, sizes, and types and works to reduce harmful bias and fat phobia that negatively impacts all people, fat and thin. 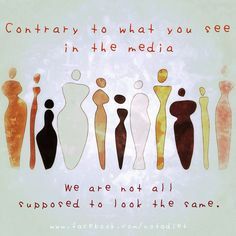 Standardized weights and "ideal" body types can be oppressive to everyone, even those that fit the "norm." While there are no studies that show that losing weight and keeping it off is possible for most fat people (Burgard 43), people of size are often made to feel ashamed of their body size and are less likely to receive proper medical care (Bacon 130). Health at Every Size (HAES) proponents recommend focusing on health regardless of weight loss, as the "thin=health" paradigm doesn’t hold up under scrutiny. Despite studies that question the health gains of losing weight, an estimated 45 million people in the U.S. go on diets every year (Boston Medical Center), often resulting in feelings of failure, low self esteem, and even increased weight gain. Dieting lowers the metabolism and can potentially undermine a healthy relationship to food to body image. Spring, 2017 community partners will include ASDAH (Association of Size Diversity and Health) and NEDA (National Eating Disorder Association). Bacon, Linda. Health at Every Size. Dallas: Bendella Books Inc, 2008. Print. Burgard, Deb. “What is Health at Every Size?” The Fat Studies Reader. Ed. Esther Rothblum and Sondra Solovay. New York and London: New York University Press, 2009. 42-53. Print. “Nutrition and Weight Management.” Boston Medical Center. 2014. Web. 13 September 2015. “Obesity and Overweight.” CDC. 2 June 2015. Web. 13 September 2015. Puhl, Rebecca M., and Chelsea A. Heuer. "Obesity Stigma: Important Considerations For Public Health." American Journal Of Public Health 100.6 (2010): 1019-1028. Academic Search Premier. Web. 11 Sept. 2015.